30% of Republicans would support bombing of Agrabah. It's a fictional city from "Aladdin". I'm speechless. I have some serious questions about the methodology of this study, but even so, you can't fix this. Democrats do only slightly better. Well, I'm all for bombing just about anything...... but I do have a minimum standard of knowing what it is. After all, I'm a trained killer, not a drone pilot. Ha, ha. Say Lausten: you do know reading too much politics, or even just news, is TOXIC to most people? TJ--is it the survey or the responses that dismay you? Next up, poll asks if Trump supports banning dihydrous monoxide. 13% of Republican primary voters would oppose a bill barring people on the terrorist watch list from buying firearms? Oh, wait. I see that 1% labelled themselves "very liberal", 5% labelled themselves "somewhat liberal", and 23% labelled themselves "moderate". There's clearly a margin of error in this poll of at least 29%. I am surprised the tally is so low. Such a law would clearly be a violation of the Fifth Amendment. Merely being on a terrorist watch list (or a no-fly list) does not count as "due process" and therefore is not sufficient to take away one's rights. But the majority still want to deport people without due process. There is no right to immigration. therefore no due process is required and we can discriminate as much as we like. Purely an administrative discretion absent a specific law. Remindz me uv the sene in Idiocracy where the cops are blasting the lawyerz car to bits and he'z cheering about it. bobbo_the_Pragmatist wrote: There is no right to immigration. therefore no due process is required and we can discriminate as much as we like. Purely an administrative discretion absent a specific law. Deportation without a fair hearing or on charges unsupported by any evidence is a denial of due process which may be corrected on habeas corpus. So, there is due process for deportation, and noncitizens do have rights. Deportation is totally different from right of immigration, or a visa. Closer are the cases where they illegally enter and are "in" the USA. I think that status is more complex, not a simple to use rule. bobbo_the_Pragmatist wrote: Deportation is totally different from right of immigration, or a visa. Closer are the cases where they illegally enter and are "in" the USA. I think that status is more complex, not a simple to use rule. Oh, I'm sorry, I thought your last post was a response to mine. Donald the liar Trump, won the Politifact Lie of the Year award – First, Second, and Third places according to their readers` poll. Not so important to tell the truth, or even know what it is, according to Trump. This should make his approval rating rise significantly. Likewise. I posted there is no right to immigration and you posted in response that rights attached to those being deported. Do you agree or not that those are two different issues? Well......there you go. a little bit of infinite timelessness on your very own plate. 30% of Republicans would support bombing of Agrabah. It's a fictional city from "Aladdin". I'm speechless. I have some serious questions about the methodology of this study, but even so, you can't fix this. Democrats do only slightly better. Public Policy Polling, which is known for adding questions in surveys to exploit Republicans who are less informed, recently found that 30% of Republican voters would support bombing Agrabah, a fictional country in the Disney film Aladdin. On December 20, 2015, WPA Research fielded a national survey of 1,132 registered voters that found 44% of Democrats would support taking refugees from that same Agrabah. ... Additionally, Democrats ages 18-34, a key constituency of President Obama, are especially eager to take in imaginary refugees. Nearly two-thirds of these voters support accepting refugees from Agrabah. It is easy to do polls that show plebes from either party to be foolish or "uninformed". Well, if Republicans are going to bomb them, it seems only fair that Democrats offer shelter to the refugees that this new war creates. What's wrong with supporting the taking in of refugees from a place of which you've never heard? If you asked me if I'd be in favour of taking in refugees from Tatooine, I'd say yes even though I know there's no such place. If I didn't know it was fictional, my answer wouldn't change. The key word in the question is "refugees". On the other hand, supporting the bombing of a place you've never heard of is obviously foolish. Gord wrote: What's wrong with supporting the taking in of refugees from a place of which you've never heard? If you do not know where they come from, then how do you know those "refugees" are not criminals fleeing a good government? Refugees cannot be vetted properly without knowing where they came from. However, I cannot fault your general point, if you are saying that those polls seem to show that the predisposition (or mood) of the Democrats is different from the Republicans (taking in refugees versus bombing some country). Yes, both polls show people are stupid. Democrats didn't do so well on the bombing question either, they just were less than Republicans. Party affiliation doesn't make you smarter. I said I questioned the methodology. No question though, saying you'd take refugees from anywhere and saying you'd bomb anywhere, two totally different statements. When I was at Indiana University, there was a 24-hour sit-in in front of some admin building, trying to get them to divest from South Africa. I went to talk to them to get informed and found just one guy, a South African, who knew more than a few general thoughts on the subject. So, this is people willing to sit at a place in the middle of the night, barely more informed on the topic than the average passer by. That's pretty much how the whole world works. If you do not know where they come from, then how do you know those "refugees" are not criminals fleeing a good government? Because they are refugees, not "refugees". Re the George Carlin quote, its true: 100IQ is average and half are below that. I have one sister with an IQ of 100. My other sister and I treat her as if she were handicapped. Nice pleasant person, teaches home economics==dumb as a post. Wifey has an IQ of 164. She isn't all that smart either---just a photographic memory, speed reader with very high comprehension and perfect retention, and a knack for languages. Can't read a map though...... and THATS what is important! You know----people are stupid. More into religion, fashion, gossip, sports and hollywood soap operas than the politics and and history that controls their lives. 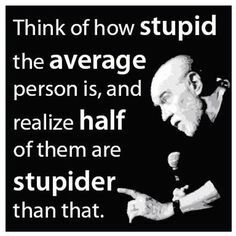 bobbo_the_Pragmatist wrote: Re the George Carlin quote, its true: 100IQ is average and half are below that. I don't think that's exactly true. The bell graph is not symmetrical, as in there are two idiots with IQ's of 80 for every person with an IQ of 120. The word "average" is a bit misleading. Matt: not true. The Stanford Binet IQ test is "crafted" until it achieves a perfect bell shaped curve for men and women with a mean, median, and mode of 100 with a standard deviation of 10 Points...... unless things have changed beyond all reason? But why would it? You raise a good point though. Test design can be tweaked to have it take almost any shape one wishes. I don't see the use or advantage of a lopsided curve though. What exactly does the IQ test measure? Hard to say. Correlates to a lot of outcomes that seem intelligence or capability related, but it doesn't measure things like social awareness or even common sense for its own many applications. My dumb sister is happy, I'm happy, Wifey gets upset when she can't get what she wants. Ha, ha. IQ tests are (allegedly) calibrated such that 100 is the median score. Thus, by definition, half of the people are below that "average". Trump and his supporters are easily disgusted – germs, body functions, foreigners, refugees, the indigent, taxes, etc. So they vote conservative socially, and liberally for business welfare – since they are not disgusted by the super-rich becoming richer, or corporations feeding at the government teat. Liberals on the other hand simply seem to be disgusted with rabid conservatives, having come to terms with biology and the world as it is. British lawmaker: Trump a "buffoon"
I see buffoons all the time. Gord wrote: I see buffoons all the time. I like the word buffoon. I call Zeuzzz a buffoon all the time. It suggests he is so stupid he could almost be considered comical. I wish he was. The reaction from Trump woud uv course be 'thanks, but no thanks', rite? He duz want to be taken seriously, you woud assume. "I am greatly honored to receive Sarah's endorsement," Trump said in a statement. "She is a friend, and a high-quality person whom I have great respect for. I am proud to have her support." That's not surprising. He'll say that about anyone who agrees with him on the thing he's interested in at the time. In many ways, Palin was a proto-Trump: she tested the waters for him on how much polemics without substance Republican voters would lap up and how "rogue" you can go and still have the support of the party. Trump owes her a lot. TJrandom wrote: Palin plea for VP? if she does she even more deluded than is obvious so far. Republican leadership might be willing to swallow the Trump frog, but only if they can put one of their princes in the VP seat. And then promptly kill Trump the day after the Inauguration. I'd chip in for an assassin. You will get a nok on the door soon. It will be the Secret Servis. They will look ominous with their grim expressionz, sunglassez, suits and little curly wire going to their earz. And then they will bust out laffing! Palin doesn't want to be VP, but she might pretend she does: she doesn't want to have to put in the work of traveling and waking up early and doing work. She resigned as governor of Alaska after only two years.